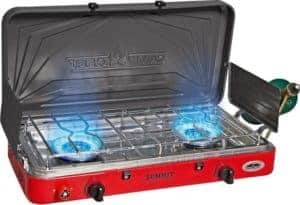 The Best Camping Stove Revealed – Top 5 List Reviewed – Camping stoves have a significant role to play when you are planning any camping trip. A great camping stove can not only provide you with a warm meal but you can also prepare a hot cup of coffee, or simply heat up some water to freshen up with, in the evening. We have developed this post to guide you about purchasing the best camping stove to suit your needs and budget. We will be discussing single and double burner camp stoves as well as compact camping stoves and wood burning camping stoves. We will briefly review each camp stove and then we will provide you with our buying guide along with a list of frequently asked questions, hopefully giving you much more clarity on deciding the best camping stove to buy for your requirements. Let’s begin with a short comparison table list first! The Weber Q1000 is a compact camping stove that uses liquid propane. This portable Q1000 grill is a fantastic looking grill and scores top points on that front. Weber’s compact gas grill is small and convenient to carry and simple to get going. You will have the steaks and sausages ready in no time at all. This grill has a large grilling surface, perfect when preparing food for more than one. There is only one stainless steel burner attached with it to generate 8500 BTU-per-Hour. The body and the lid of this portable grill are prepared with aluminum and the porcelain is enameled along with cast-iron. 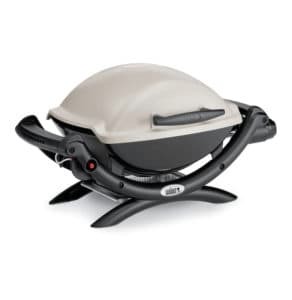 The Q1000 liquid propane grill uses 14.1 or 16.4 oz LP cylinder. You can purchase these cylinders separately as well. The split grates permit you to use this compact camping stove for griddle or grate and combination of both. There are two main settings involved such as the infinite burner control and the push-button ignition that are easy to operate. The catch pan is easily removable so you can enjoy a delicious cooking experience preparing your breakfast, lunch, and dinner. If you love to travel and go camping with friends or family then the Weber Q1000 grill is a fantastic choice. It is easy to use due to its superb functionality, reliability, durability, and portability. In our opinion, this is the best overall compact camping stove. To access the latest Amazon price Click Here! The EcoZoom manufactured the Rocket Survival Stove with energy and fuel saving in mind. 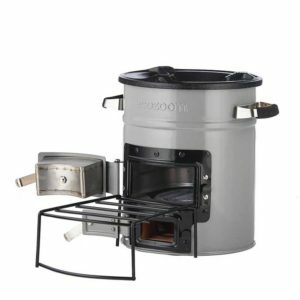 This is a fantastic camping stove because there is no need to use any kind of gas, propane, or electricity. The EcoZoom uses wood, dried biomass, and charcoal instead of fuel. Due to this, it is extremely versatile, durable, and more efficient to use anywhere at any time. Generally, this product is equipped with stainless steel pots, a complete cooking set for your camping, and the cookware is cast iron. The handles of this product are coated with silicone grips which means safe handling when cooking, no need for gloves. In addition, it contains a stand/support to hold the biomass, wood, or charcoal for easy feeding into the burner. This EcoZoom Versa generates 2000 BTU-per-hour insulated with a ceramic material. This is the best camping wood stove as it increases its flexibility because and does not produce any harmful emissions while burning the stove. A fantastic choice if you do not want to go with a gas or electric option. 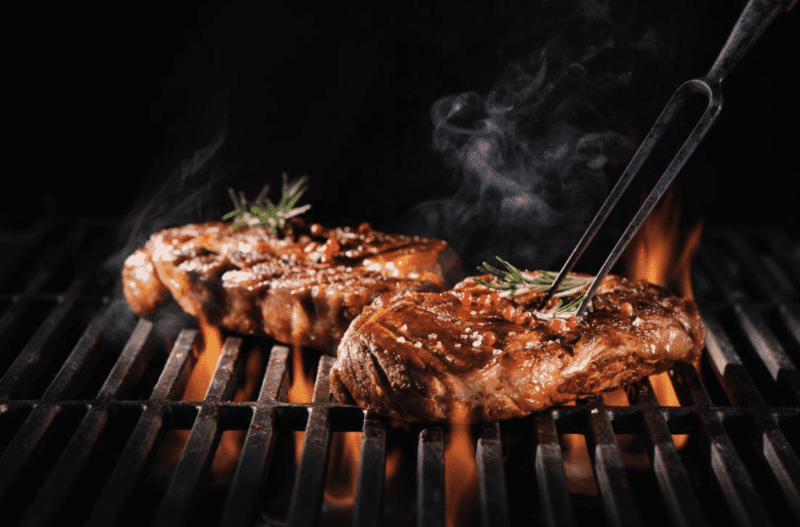 Slower cooking times due to time required for heating up wood or charcoal. This Rocket Survival Stove is fantastic for money due to its outstanding efficiency, durability, portability, and flexibility. This camping wood stove uses charcoal, biomass, and wood to cook your meals so there is no need to use propane, gas, or electricity. The Camp Chef high-output two-burner stove uses 20000 BTU high-pressure in each burner to heat up. This is best for group/family camping because the double burner camp stove cooks your food easily and quickly along with matchless ignition system. This Everest camping stove is equipped with a propane cylinder, aluminum coated burner, three-sided windscreen, and an influential burner that works even in windy situations. The stove looks stylish and trendy due to its stainless steel finish. With an easy to clean tray and an updated temperature control and convenient carry handles make this is a superb all-rounder camping stove. Moreover, the cooking surface area is about 317.25 square-inches and it has adjustable feet that help to balance the stove in your cooking place. 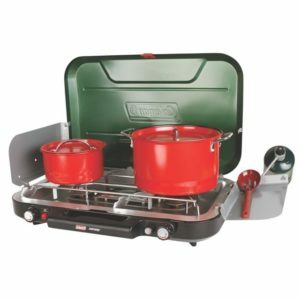 The Camp Chef double burner camp stove has adjustable feet to balance the level of the stove. This Everest high-quality two high-pressure burner stove is lightweight and easy to fire up with the ignition that comes with the matchless system. With the 3 side wind protection its a great choice for wide open spaces and great for group cooking. To access the latest price Click Here! The Coleman Eventemp 3-burner propane stove presents you with a lightweight, portable, durable, and extremely efficient stove to make your outdoor experience great. It provides equal temperature burners for ultra-fast cooking. It uses matchless system ignition technology that utilizes an electric spark for lighting up the burners. You can use this by pushing a button so there is no need to use any lighters or matches. The non-slip feet give stability to the stove and you can easily whisk in the pans or pots. The pressure control technology helps to provide stable heat for consistent and better performance. This PerfectFlow technology also works in such situations like in cold weather or low fuel. This Eventemp stove is a great choice because it contains side panels to guard the burners against the wind. These panels are fully adjustable also. It acquires 28000 BTU to heat the burner by using the instant-start ignition technology. You can easily and quickly remove all stains from the chrome-grated grate after cooking your meal. Coleman Eventemp 3-burner propane stove is a good choice especially for those who love to camp in all weathers. The special wind guard side panels increase its efficiency and provide PerfectFlow temperature control that helps to provide consistent and even heat to the burners for preparing your meal. The Coleman Triton 2-burner stove is another fantastic outdoor camping stove which easily fits into the top 5 best camping stoves. The 22000 BTUs of power helps to provide heat the two adjustable independent burners. The cooking area presents a 12-inch and a 10-inch area to place your pan for preparing your meal. Additionally, the PerfectFlow technology is used to keep the heat stable and consistent for showing better performance of the stove during your camping adventure even in cold weather or when low on fuel. This double burner camp stove is also equipped with PerfectHeat technology that uses a combustion fuel process to carry out very effective heat to cook your food with little fuel. The side panels shield the burners from wind and you can adjust it to suit a larger pan. It also gives you the facility to fold it down and use it as a side table for keeping items on. A wonderful choice for family camping trips. The Coleman’s double burner camp stove is a great option as it is equipped with PerfectFlow, PerfectHeat technology along with 3 sided Wind block panels. This portable and affordable camping stove deserves to be in the top 5. Our personal favorite of this roundup turns out to be the Q1000 by Weber. It not only comes at a very good price but also provides plenty of value. It has a burner equipped with a capacity of 8500 BTU an hour or heating 189 square inches of the overall cooking surface. The cooking grates are made of cast iron enameled with porcelain while the lid and the body are made of cast aluminum. The best part is you don’t have to assemble anything and it comes out of the box fully assembled. The stove comes with ignition (push button) and infinite settings to control the burner valve. It is the best camping stove in almost every aspect. All stoves in this article are of very high quality overall, choose according to your personal needs and requirements. We hope that you have found this article informative and interesting. For any queries or suggestions, you can reach out to us by dropping your comment in the section below. P.S Check out our latest article reviewing our top 5 best 6 person tents. Read It Here! The Top 5 Camping And Fishing Kayaks On The Market Today Full Review! The BioLite CampStove 2 Review | Is It The Worlds Best Energy Efficient Camp Stove?